Circuit Media Attends Accessibility Event in D.C. 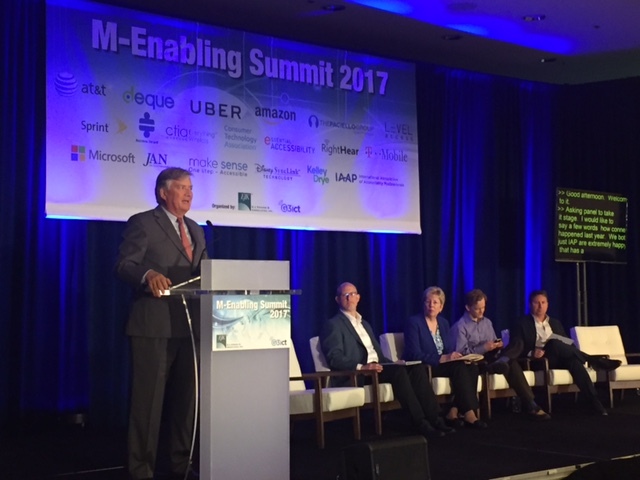 Hundreds of accessibility companies and individuals attended the M-Enabling Summit for Accessibility June 12-14 in Washington D.C. to network, explore new assistive technologies, conduct and attend technology showcases and sessions, and to learn what’s going on in the world of accessibility. The International Association of Accessibility hosted the event, and Sarah Green, our Associate Editor, from Circuit Media attended! The conference included sessions hosted by recognizable companies who are working with accessibility professionals/companies to improve content for people with disabilities such as blindness and deafness. Companies like Google, Amazon, Uber, Level Access, AT&T, The Paciello Group, Microsoft and Disney came together to discuss the ways in which companies large and small can make their products accessible to those with disabilities. What Does This Mean for Circuit Media? As a growing media company that is starting to build upon its own accessibility work such as document remediation, web/design audits, this conference offered a great insight into what kind of technology is out there, which companies are performing accessibly work, and who potential partners may be as we look to expand our accessibly/Section 508 capabilities. Section 508 is a federal regulation that requires public and federal employees to make technologies when developed, procured, maintained, or used by federal agencies accessible to those with disabilities. Some of these may include physical, cognitive, or sensory barriers like colorblindness or need for touch screen. Technology is deemed accessible when it can be used as effectively by people with disabilities as those without. We are proud to be a 508-compliant company and look forward to attending more accessibility conferences and encouraging more companies to create accessible technology as well!